If you're snowed in today, I have the perfect idea what to do -- check out your 2014 annual reading. If you're craving an in-depth understanding of your astrology, that is, a truly personal take on your transits, this is the reading for you. I have a special "snow day" offer -- if you get your Sun sign, we will include your rising sign as our gift. My readings are designed to work with these two angles of approach. If you don't know your rising sign, write to me with your birthdate, time and place, and I will look it up for you. Purchase today, Feb. 13, and I will include your rising sign. Don't worry if you don't know it -- I'll look it up for you. In your 2014 astrology reading, called The Mars Effect, I speak to your personal concerns, your growth needs, your desires for deeper meaning and success. The responses I get reflect this; as one client wrote, "I logged onto the report last night and I am so impressed with Eric's analysis. No astrologer has ever gone so in-depth and seemingly nailed parts of my psyche like he has." Another client wrote, "I am still finding new information and suspect this will be the case for quite some time -- it's an incredible gift to have and I sincerely thank you for your heartfelt efforts in delivering such poignant and useful readings." My annual readings feel so alive, present and intimately personal, they come close to a one-on-one consultation -- at a fraction of the cost. 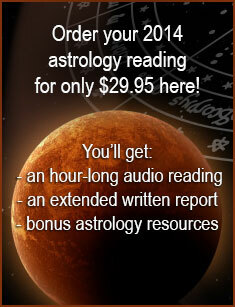 You can have instant access to your 2014 reading for only $29.95 here. And write to me with your full birth data (confidentially, of course) and I'll include your rising sign. As one customer noted, "It is like you are sitting in front of me and speaking about my experience of the last three years. Amazing!" If you want more information, you can purchase additional readings for your Moon and rising signs. My interpretations work for your Sun, rising sign, Moon -- even your relationship angle (your opposite sign). What you read about your relationships, money, creativity and spiritual themes will help you improve your life. Plus, it's fun: "I stayed up LATE last night to listen to my reading. Very spot on, juicy and compelling!!" I invite you to receive my expert year-ahead readings now; they're a great way to see the big picture of your life this year in intimate, personally relevant detail. Copyright © 2013 by Planet Waves, Inc. All Rights Reserved. Other copyrights may apply.